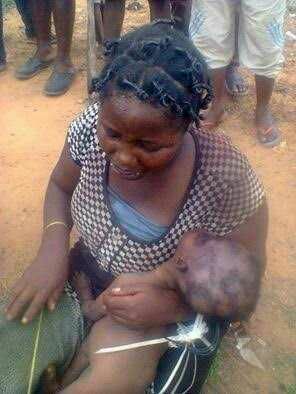 Igbo woman allegedly killed 1year old child, gouged out her eyes (photo) - BlogIT with OLIVIA!!! A woman in Onicha Uboma Autonomous Community in the Ihitte/Uboma Local Government Area, Imo State, identified only as Ifeoma allegedly killed her one-year-old child, gouged out her eyes and drank her blood. According to Daily Independent, the 39-year-old woman was alleged to have committed the heinous act inside her husband’s shop. Mr. Azubuike Emedom returned from a business trip to find his wife and child missing. "It was gathered that after searching for them in the neighbourhood without result, Mr. Emedom proceeded to his shop, although he thought it abnormal for them to be in the shop that early. When he got to the shop, he discovered that the shop was locked from the inside, but after repeated knocks and Ifeoma’s failure to open the door, Mr. Emedom was said to have broken down the door, only to find his wife inside, blood on her mouth and the baby wrapped in blood stained cloth. Mr. Emedom uncovered the baby, he discovered that she had died, even as her eyeballs were plugged out and blood gushing from the sockets. The baby’s hands and legs were also broken. "A community leader who spoke under anonymity claims that Ifeoma is of a ‘marine spirit.’""I believe she used this child for sacrifices, she sucked the blood of the child because by the time we caught her, her mouth was full of blood.She killed the baby intentionally. She always renders sacrifice to their gods in the river. Some months ago, she attempted to kill a woman from our community. She injured the woman with a knife," he said.The suspect has been arrested and detained at the Ihitte/Uboma Police station.Deputy Superintendent of Police (DSP) Andrew Enwerem, the Police Public Relation Officer of the Imo Police Command who confirmed the story said investigations were on going.